SUPERfestival is coming on next 12-13-14 October 2018! Milan has changed rapidly over the last seven years: it has become a global city that attracts countless investors and tourists in large part due to the plentiful resources in the financial, media, fashion, and design sectors. Like many international cities, Milan is experiencing continuous growth and renewal, made visible through investments in high-quality transport and infrastructure systems; a thriving expansion of initiatives related to the so-called sharing economy; emphasis on new strategies for land management, urban biodiversity, social innovation; and a growing political climate that encourages manufacturing entities to return to the cities. This development is, at the same time, stimulated, fed, and accompanied by a rising and widespread active citizenship that has regained an important role in the discourse and actions that define our public space. 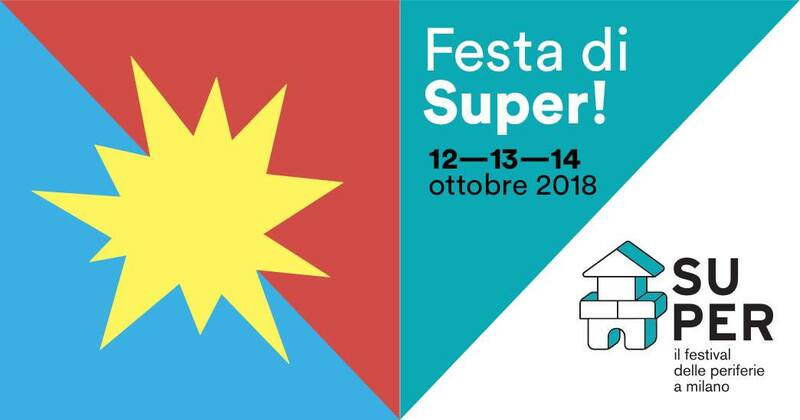 Super is a festival of the peripheries, which aims to create a narration including all that exists, spring and activate in the Milan peripheries. An archive of practices, actions, realities that will be slowly told by immediate, performative and pop formats which involve a large audience. Super has walked 23 tours in the peripheral neighbourhoods of the city, meeting and getting more than 160 subjective reports on the state of peripheries from people which is active in groups, associations, small enterprises, cooperatives and other entities of the third sector. For this reason, we define Super as a ìslowî Festival: moving around the city centre, it has generated projects and events, which has dealt with a taxonomy of concepts which characterise the urban reality and the life of those actors we have met there: dwelling, working, moving, entertaining and reproducing, socialising, reprogramming, growing, producing value, communicating. On 12-13-14 October, Super will put on stage an engaging, popular marathon of events spread in the city: the different events will take different formats – such as debates and projections, workshops and talks, shows and performances, installations and experiences ñ and involve different audiences depending on the neighbourhoods where they are presented. Follow us on Facebook to get all the info about the different events. Associazione TumbTumb comprises a heterogeneous group of professionals (anthropologists, designers, architects, urban planners, photographers, journalists, performers, etc.) which aims to build horizontal connections, share skills, experiences, viewpoints and relationships. TumbTumb primarily bases its action on the act of listening to territories, paying attention to their many voices. It pursues contamination as a chance to mingle diverse languages, research and communication practices in order to build narrations and relations which interweave with old and new technologies, the web and visual arts. TUMB TUMB experiments and promotes new forms of activism and politics capable to interact with the urban present of the city and what is still in-the-making. nxobsgkudur,Very informative useful, infect very precise and to the point. I’m a student a Business Education and surfing things on Google and found your website and found it very informative.